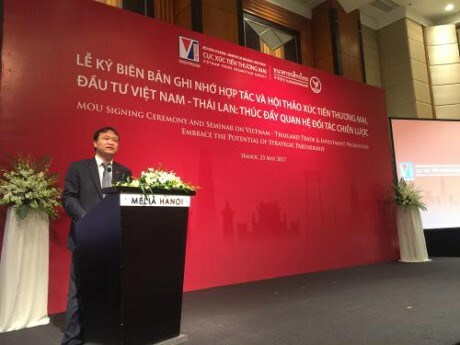 Hanoi (VNA) – The Ministry of Industry and Trade (MoIT) and the Thai Ministry of Commerce jointly organised a workshop to promote trade and investment cooperation between Vietnam and Thailand in Hanoi on May 23. Addressing the event, Deputy Minister of Industry and Trade Do Thang Hai said the event takes place when member nations of the ASEAN Economic Community (AEC) are accelerating the realisation of commitments towards a single market and production base, a competitive economic region, equitable economic development, and integration into the global economy. Hai suggested the two sides organise more trade and investment promotion activities and encourage more Thai investment in Vietnam while assisting Vietnamese firms in entering the Thai market, thus contributing to the trade balance. With the determination of the two Governments and proactive involvement of the nations’ enterprises, Vietnam and Thailand will see stronger economic cooperation, with two-way trade to reach 20 billion USD by 2020, Hai said. For his part, Thai Deputy Minister of Commerce Winichai Chaemchaeng spoke highly of the assistance the MoIT has provided for the two countries’ enterprises to promote trade and investment cooperation. He underlined the huge trading potential between the two neighbours thanks to their favourable transport conditions and policies on goods exchanges. The Thai official expressed his belief that the cooperation between Vietnam and Thailand will contribute significantly to the solidarity and cooperation in ASEAN.